With the spirit of saving money, one cannot be too thrifty when it comes to hair care. While we want the very best at the lowest price, curly girls have been lucky in recent years, as we have more brands to choose from and that drives down price. No one wants a ton of bad products layered on their hair and creating frizz or damage, so we make sure to check ingredients for what we love, hate, and downright steer clear of. For many of us there are specific ingredients we are sensitive to. Manufactures are taking heed to common allergies like nuts, soy, and even protein, and Cilinhamix from Curly Q&A asked about one such product. Hi, everyone! I have medium to high porosity, thick and protein sensitive hair. I do use a little shampoo mainly in my roots every 2-3 days, otherwise my hair gets weighed down. Any suggestions of a CG friendly gentle, protein and sulfate free shampoo to use this often? Thanks! We are lucky to have brands willing to take a step further and create products to accommodate all hair types, porosities, and allergies. Know that cleansing too often can be drying for your hair. An alternative to shampooing is to occasionally rinse with water and opt for a botanical or cleansing conditioner instead. This will help keep hair moisturized without buildup. If you do prefer to cleanse with shampoo every couple of days, here is a list of sulfate-free and protein-free shampoos that are Curly Girl (CG method) friendly and gentle enough to use regularly. No sulfates or proteins, but this moisturizing and softening shampoo has tons of goodness including water, coconut, and shea butter. A gentle yet hard-working shampoo for extra dry hair in need of moisture and softness. No silicones, sulfates, or proteins in Bee Mine Botanical Moisturizing Shampoo. Just water, surfactant blend, calendula, lemongrass, rosemary, and lavender extract bring together a formula that removes residue without removing moisture. 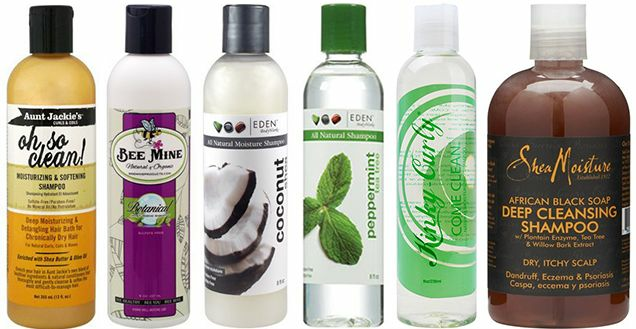 This cruelty, silicone, sulfate, and protein-free shampoo from EDEN BodyWorks is a mild cleanser that restores the much needed moisture to your strands. This tea tree formula is formulated to treat dry, flaky scalps while removing all traces of dirt, oil, and buildup. No silicones, sulfates, or proteins but loads of pure botanicals to clean effectively and gently. No parabens, sulfates, proteins, or silicones in this hardworking and moisturizing shampoo. With the power of mandarin orange extract and sea kelp, the proper moisture balance will be restored along with a cleaner scalp and hair. Get deep cleansed hair from SheaMoisture African Black Soap Deep Cleansing Shampoo. Ideal for dandruff or irritated scalps that is dry, itchy, and flaky. Plantain enzymes help to calm the irritation while tea tree oil removes all buildup. No sulfates, parabens, or proteins to worry about.